The Calm Cottages is a newly built nature vacation home in Nathuakhan on Nainital - Mukteshwar road. 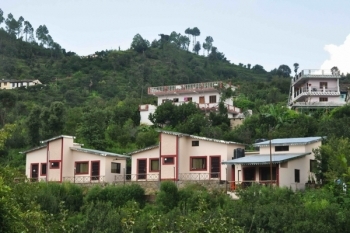 The cottages are situated in a small, beautiful village in Ramgarh block of district Nainital. A perfect place for nature lovers as they can witness the panoramic view of mountains while walking through the lush green orchard of peach, plum and many other trees. Spend time with your family or friends, away from cityâ€™s hustle and bustle, read books and play games in the lawn. Guests can even plan excursions to famous places like Mukteshwar, Golu Devta, Bhimtal, Nainital, Almora, Sattal, Naukuchiya tal, Ranikhet , Binsar and Jageshwar Temple. All destinations range at a distance of 25 to 80 Kms approx. The Calm Cottage is located in Nathuakhan village at about 45 kms from Nainital on Mukteshwar Road. Mukteshwar Mahadev Temple is at just 20 kms from the cottage. 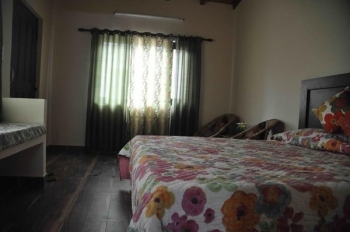 The hotel offers you 4 well furnished, decorated rooms with attached bathrooms. Guests will be delighted by two attic rooms, especially kids & adults. Each room is named after state symbols like Double rooms are The Monal & The Kasturi and Double room with Attic are The Buransh & The BrahmKamal rooms. The hotel has a dining area where guests are served with delicious homely cooked meals prepared by efficient staff from the local village. We try to source most vegetables from our kitchen garden or from the village. Guests will love to have local Pahadi delicacies on the plates. The staff caters to all the needs of the guests from 7 am to 9 pm only. - TV with dish antenna in our common area, Rooms with Geysers in Bathroom, Balcony outside every room to observe beauty of nature. - Activities like Bonfire and indoor games like Carom, Chess etc, Open area to walk in the vegetable garden and an orchard. Extra Bed Charges : Children in age group of 5 to 12 years will be charged Rs. 1000 per night (for meals without extra bed) and above 12 years will be charged Rs. 1500 per night. - Double Room includes The Monal Room and The Kasturi Room. - Double Room with Attic includes The Buransh Room and The Bhramkamal Room, Including accommodation for two extra persons (Mattress only) with Meal will be charged at the rate of Rs. 1000 per person per day. - Tax extra as applicable, Check in: 12 Noon, Check out 10 Am. - Credit Cards are not accepted. By Air: Nearest Airport to Nainital is Pantnagar. You can board a flight for Pantnagar from Delhi on Monday, Wednesday or Friday. The airport is at a distance of 72 Kms from Nainital. You can book a taxi to reach Nathuakhan. Taxi are easily avilable. By Train: Kathgodam is the nearest railway station to Nainital, at a distance of 41 Kms. Kathgodam Railway Station is well connected with major destinations like Delhi, Dehradun, Howra, Haridwar, Jammu etc. Some important trains are Ranikhet Express, Bagh Express, Dehradun-Kathgodam express, Garib Rath, Shatabdi Express etc. Taxi are easily avilable for Nainital or Nathuakhan from Kathgodam. Route 1: From Delhi, come to Rudrapur via Hapur Bypass, Moradabad and Rampur. From Rudrapur, come to Bhimtal via Haldwani and Kathgodam. Now move towards Bhowali, Malla Ramgarh and Talla Ramgarh. You will reach Nathuakhan. Route 2: From Delhi, reach Moradabad via Hapur Bypass. Take a left turn before Rampur to reach Swar. Reach Nainital via Bajpur and Kaladhungi. Now keep travelling towards Bhowali, Malla Ramgarh and Talla Ramgarh. You will reach Nathuakhan.